The CTD Model CDM300R is our most versatile 12" Double End Saw. 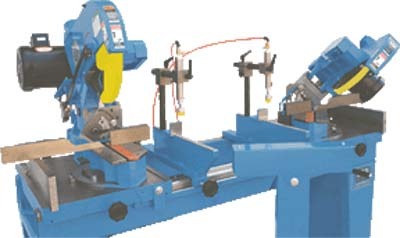 It is capable of mitering and compound mitering simultaneously. It’s design incorporates calibrated angle settings and quadrants for fast, accurate set-ups. The CDM300R is available with many options and lengths. Iron Castings: Tables are precision machined and ground iron castings with milled keyways in tables to guide fences. 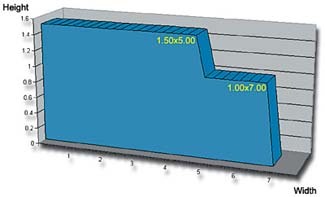 Table: Saw heads swivel from 90º to 45º towards each other with degree markings and pointer; stops are at 90º and 45; angular adjustment of saw head away from each other available as option; other angles possible; phenolic chip breaker included. 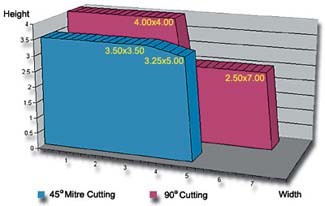 Compound of Tilting Angle: Saw head will compound angle cut up to 45º in direction shown with positive pin stops at 90º, 22-1/2º, and 45º; bottom of blades point towards each other; saw will also compound cut up to 10º on other side of vertical plane. Floor Stand: Heavy gage steel; eight foot centers with traveling right hand carriage on rack and pinion; length measuring scale; optional length centers available to 40 feet 12M; Digital Length Measurement available as optional accessory. Blade Guard: Completely encloses blade in rest position; lower rotating blade guard pivots up into main stationary blade guard as saw heads pivot down to cut. Fences: On each side of blade are keyed to base and are easily adjustable front to back and side to side. Actuation: Two inside vertical clamps must be tripped by foot valve, then a two-hand anti-tie down, maintained contact safety control will work the air downfeed of saw heads; an air filter/regulator/lubricator with auto drain is provided. Air Pressure & Consumption: 75 PSI 5.2kg/cm2; 4 CFM at 75 PSI .11 cubic meters at 5.2 kg/cm2; based on 10 strokes per minute. Dust Collection: Four, 4" round 102mm outlets are provided, two for each saw head; 900 CFM required per saw head. 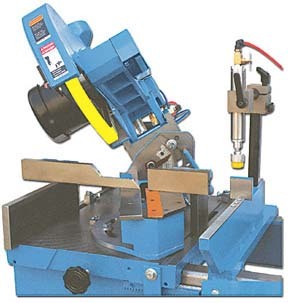 Production Rates: 10 strokes per minute; actual production rates will vary with type and width of material to be cut. Size & Weight: 32" 81cm front to back x 64" 163cm High x 120" 305cm Long; Weight 1,200 lbs. 544kg.